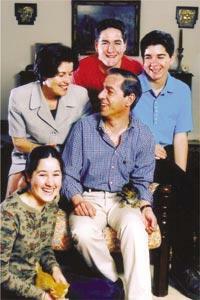 Dr Gonzi with his wife Cathrine and children Mikela, David and Paul. Lawrence Gonzi was born in Valletta on July 1, 1953 to Louis and Inez née Galea, who are now 83 and 81 years old respectively. Dr Gonzi's principal activity in his youth was football and he formed part of the football teams of the seminary, the law students when he was at university and of Fgura athletics. He has been actively involved in the voluntary and NGO sectors since 1976, particularly in the sectors related to disability issues and mental health issues. He was general president of the Malta Catholic Action between 1976 and 1986. The late Archbishop of Malta Sir Michael Gonzi was his great-uncle, Dr Gonzi is married to Catherine née Callus and they have three children, David, Mikela and Paul. He studied law at university and was the contemporary of many whose names are very familiar: Chief Justice Vincent Degaetano, Mr Justice David Scicluna, Deputy Attorney General Silvio Camilleri, George Abela, Austin Gatt, Louis Galea, Joe Borg and Andrè Camilleri, among others. His doctoral thesis focused on unlawful assembly. He graduated in 1975 and commenced his private practice in partnership with Louis Galea from Dr Galea's office in Zurrieq. Tonio Borg and Josè Herrera also worked in the Zurrieq office at one point and the standing joke is that all the lawyers who work at the Zurrieq office end up in parliament. Dr Gonzi worked as a part-time lawyer with the Mizzi Organisation and served as chairman of the board of directors for nine years. He entered politics in 1987, when he contested the May general election as a candidate with the Nationalist Party in the second and third electoral districts but failed to get elected. He was elected Speaker of the House of Representatives on October 10, 1988 and was unanimously re-elected on April 5, 1992 for the seventh legislature until 1996. In October 1996, Dr Gonzi successfully contested the general election and was the only opposition member elected to parliament from the second district. In November he was appointed opposition party whip, secretary to the parliamentary group and shadow minister for social policy. In February 1997, Dr Gonzi was elected secretary general of the Nationalist Party. He contested the September 1998 general election and was again elected from the second district, taking his oath of office as Minister for Social Policy and Leader of the House of Representatives on September 8, 1998. Following the election of Guido de Marco as President of Malta, Dr Gonzi contested and was successfully elected deputy leader of the Nationalist Party on May 2, 1999. He was designated as Deputy Prime Minister and Minister for Social Policy two days later. In April 2003, Dr Gonzi was re-elected from the second district and reappointed Deputy Prime Minister, Minister for Social Policy and Leader of the House. Dr Gonzi is responsible for the coordination of inter-ministerial activities as well as for those sectors relating to social security, family and social welfare, the elderly and persons with disability, gender equality, housing, industrial and employment relations and co-operative systems. Between 1987 and 1988 Dr Gonzi was chairman of the Pharmacy Board and member of the Prisons Board. He was chairman of the National Commission Persons with Disability between 1987 and 1994 and its president between 1994 and 1996. During this time he was also chairman of the National Commission for Mental Health Reform. During the years 1994 and 1995 Dr Gonzi was chairman of the Electoral System (Revision) Commission.